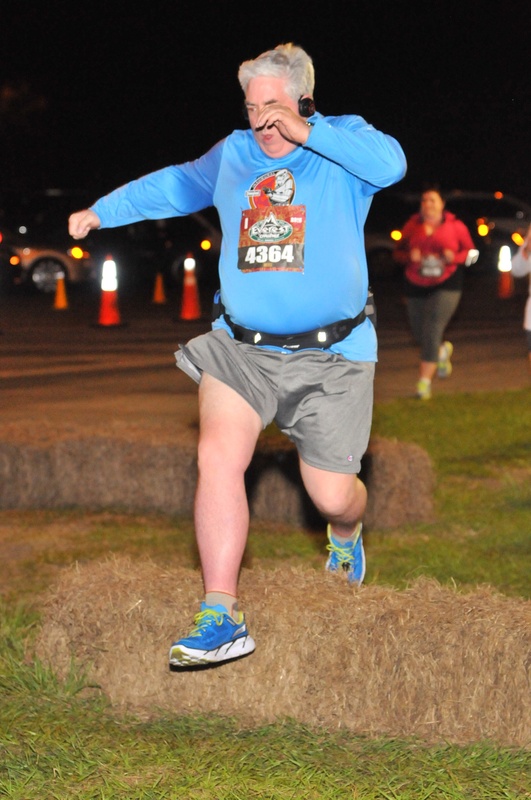 The run portion of the Expedition Everest Challenge is a 5K. Our course started out by running around the circumference of the Animal Kingdom parking lot. This portion of the run made up approximately a mile of the 5K course. 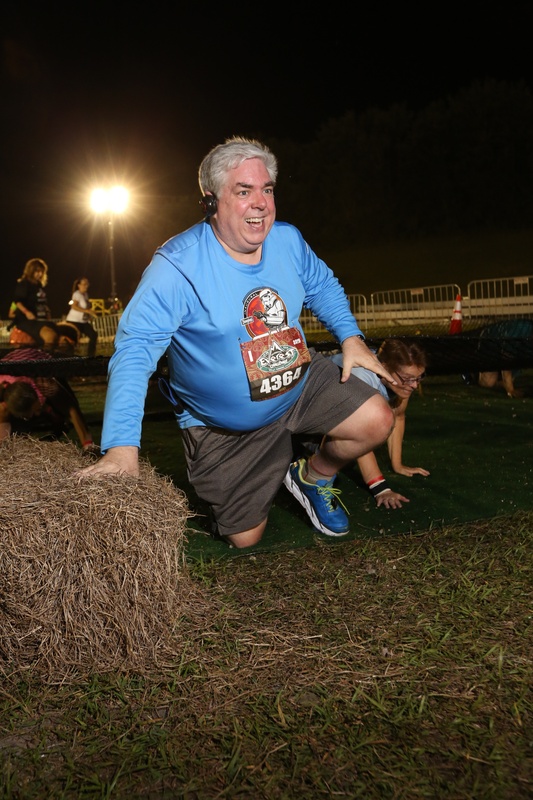 Just before we reached the park entrance, we came to the first of 3 obstacles along the course — the hay bales. These were pretty low — probably a foot high and a foot long. It would certainly be possible to just step over them, but I got into the spirit of the challenge and tried to take them at speed. Soon after that I was at the 1 mile marker. I was running with the new Apple Watch, and had decided to try to workout app on the watch rather than running with the Garmin that I usually use. I was a little concerned that we hit the 1 mile marker while the watch showed me still well short of a mile (I think about .8). After the race, I learned from other runners that it wasn’t my watch — the course was not officially certified and was in fact quite a bit short (somewhere in the 2.7 – 2.8 mile range). That’s a surprisingly large miss even for a non-certified course. Our course through the park was essentially a clockwise lap around the park — through the Oasis, left in front of the Tree of Life into Africa / Harambe, then cutting across to Asia and the Expedition Everest area. Our path then took us into backstage areas. There was a long out-and-back stretch along a roadway, and here we came to the second obstacle, which was to crawl under netting. Fortunately this was on clean dry grass so it wasn’t too tough, although it was surprisingly exhausting and I really felt glad to get back to my feet at the far end. At this point, continuing on the roadway away from the Animal Kingdom, I was overtaken by a couple of riders on bicycles. Other runners were alerting everyone to move right so the riders could get by. Someone said ‘Fire Department’; I’m not sure if that was correct but they were certainly EMTs from somewhere, as within a minute of them passing me I came upon the scene where they were performing CPR on a runner. I heard conflicting stories about the outcome, so I’m not sure if he was OK or not. I certainly hope that it turned out OK.
After we finished the out-and-back leg of the course on the roadway, we turned left and merged with runners who were finishing up the ‘scavenger hunt’ portion of the challenge which comes after the 5K. At this point there were signs and recorded audio telling runners to merge to the right, and scavengers to merge to the left. After this, it was a turn into the finish chute for the run. But unlike other races, when you finish the run, you’re far from done (and there is no medal awaiting you for “just” finishing the 5K). There was a stop for water bottles, and then race volunteers handing out sharpies with small LED flashlights attached. Then you picked up your first clue for the scavenger hunt. The details of the scavenger hunt will be in the third and final Expedition Everest Challenge recap post. This entry was posted in Disney, runDisney, Walt Disney World and tagged Expedition Everest, Expedition Everest Challenge. Bookmark the permalink.